Forty years ago today, the Brazilian military dictatorship launched its attack against the anti-dictatorship guerrillas inhabiting the Araguaia River basin in the state of Goiás (today, Tocantins). The campaign, and the subsequent disappearances of dozens of citizens, marks one of the darkest and most extreme cases of repression and human rights violations of Brazil’s 21-year military dictatorship. 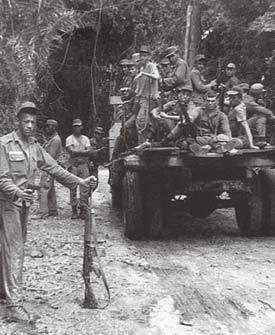 Brazilian soldiers sent to suppress the guerrilla movement in the Araguaia basin in 1972. As the military regime’s tactics against students and leftists increased in the latter half of the 1960s, many students and leftists left school or their jobs to join small guerrilla movements that employed revolutionary language and violence in an attempt to spur a mass uprising that would overthrow the regime. While many of these groups operated in urban centers like Rio de Janeiro and São Paulo, a small group of several dozen leftists converged on the Araguaia basin from which they hoped to lead a popular uprising against the regime. 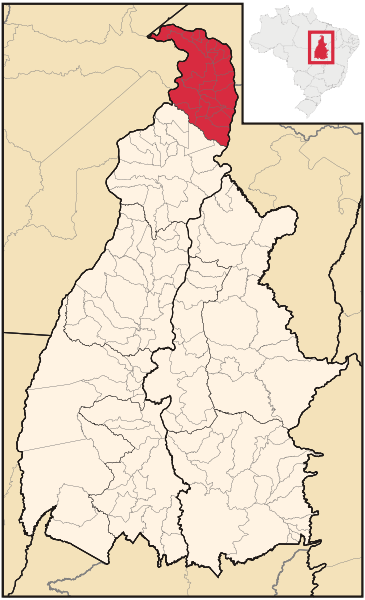 The area around the Araguaia River basin, where leftists hoped to lead a revolution from northern Brazil in what is today the state of Tocantins. Unlike their urban counterparts, the leftists from the Partido Comunista do Brasil (Communist Party of Brazil; PCdoB) in the Araguaia basin subscribed to Ché Guevara’s experiences and Régis Debray’s ideas of foquismo. Foquismo advocated revolution by means of a paramilitary vanguard that would be based in rural areas, from which it would launch attacks that weaken the targeted regime even while building up popular support among the rural poor. The theory as Debray formulated it drew directly from Guevara’s own experiences and successful tactics in the Cuban Revolution. While these tactics had worked in the small island country of Cuba, in retrospect their utility for Brazil (which is larger than the United States without Alaska) seems problematic, to put it lightly. Indeed, although Cuba’s revolution had overthrown the Batista regime, when Guevara tried to employ these tactics in the Congo in 1965 and in Bolivia in 1967 (where he ultimately died), he met with failure. Nonetheless, university students and other leftists who drew from Guevarista Marxism moved to the Araguaia region in the late-1960s, hoping to build relations with the peasants in the area and establish the infrastructure for a revolution that would overthrow Brazil’s military regime just as Guevara and Fidel Castro had overthrown the dictatorship of Fulgencio Batista more than ten years earlier. The military government also had troops scattered in the area by the early-1970s, but it was only in 1972, after having combated urban guerrilla groups and killing leaders like Carlos Marighella and ex-military member and leftist leader Carlos Lamarca, that the regime turned greater attention to the leftists in Brazil’s interior around the Araguaia River basin. 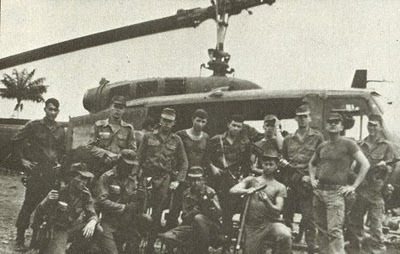 Young soldiers sent to the Araguaia "front" in early-1972. Although the regime initially captured a handful of combatants, including José Genoíno, who would serve as the president of the Partido dos Trabalhadores (Workers’ Party; PT) in 2002, it quickly moved to a policy of total liquidation of all those fighting for the guerrillas or aiding them. Ultimately, the regime captured and murdered at least sixty guerrillas, whose bodies they then buried in unknown locations or otherwise disposed of them. Additionally, several residents in the region went disappearing, leaving more than sixty people dead, with the location of their remains unknown to this day. In its attempt to quash the Araguaia guerrilla movement, Brazil's military regime murdered and "disappeared" more than 60 individuals. While the regime put significant energy and resources into eliminating the movement and all those tied to it between 1972 and 1975, most Brazilians at the time were completely unaware of the guerrilla movement or the efforts to destroy it, thanks in no small part to the military’s heavy reliance upon censorship in this period. The families of the victims were more than aware of the loss of their loved ones, however, and began legal proceedings to find out what had happened to their relatives in the early-1980s, as the regime opened up and Brazil slowly redemocratized. However, in spite the Inter-American Human Rights Commission’s 2010 decision that declared that Brazil’s failure to investigate and prosecute those guilty of extrajudicial murders in Araguaia violated the American Convention on Human Rights, Brazil has failed to go after those guilty of crimes in Araguaia, maintaining the 1979 amnesty law that pardoned all human rights violators in Brazil. 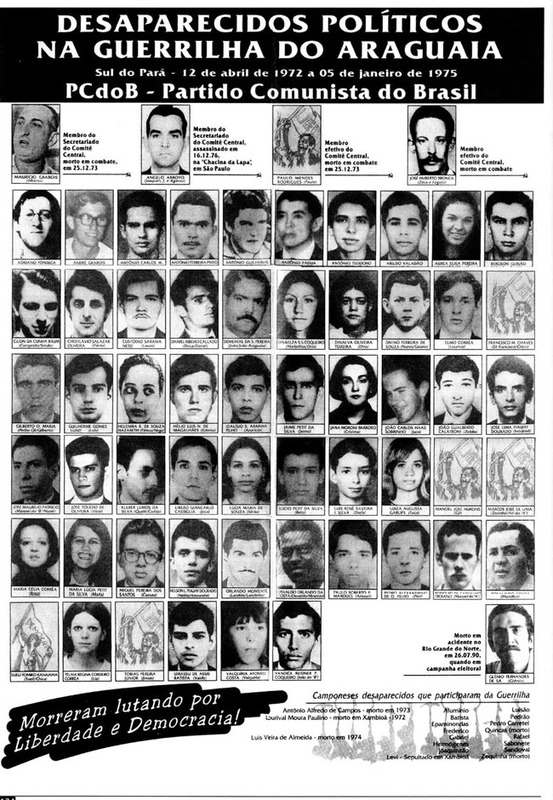 To this day, the Brazilian military has remained silent on the possible whereabouts of the bodies, even denying the existence of archives or documents that might shed light on the Araguaia conflict, and the relatives of those who died still do not know where their loved ones’ bodies are, forty years after the military first launched its concentrated effort to suppress resistance in the region. This entry was posted in Brazil, Brazil's Military Dictatorship, Guerrilla Movements in Latin America, On This Date in Latin America, The "Disappeared". Bookmark the permalink.